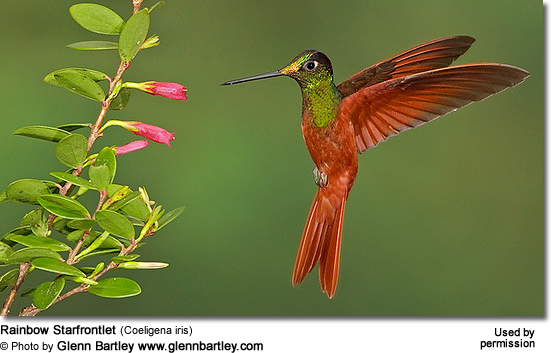 The Rainbow Starfrontlet (Coeligena iris) is a large South American hummingbird that is native to Ecuador and Peru, where they are fairly common. They inhabit subtropical or tropical humid montanes, high-altitude shrubland, and heavily degraded former forests - usually at elevations of 1,500 - 3,300 m. They are usually seen along the edges of forests and adjacent shrubby areas. Range: Northern Peru (Cutervo, Cerros de Amachonga). The Rainbow Starfrontlets average 13.5 - 14 cm (~5.25 - 5.5 inches) in length. The beak is about 2.9 cm (~1.1 inch) long. The plumage is mostly rufous colored. Nominate Coeligena iris and subspecies Coeligena iris fulgidiceps: The male's foregrown is a glittering green with a blue spot on the crown . Subspecies farther south on the west slope of the Andes look alike, but the nape (back of the neck) and upper back is coppery with no black on the neck in the subspecies Coeligena iris flagrans. 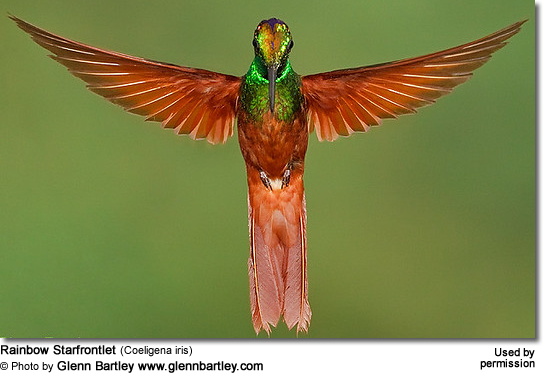 Subspecies Coeligena iris aurora, occurring in northern Cajamarca, has an all-green crown and a blue upper throat; those found in southern Cajamarca have a central blue stripe through the crown. Females look like males, but have a duller plumage and their throat color is sometimes mixed with buffy. The female Rainbow Starfrontlet is responsible for building the cup-shaped nest out of plant fibers woven together and green moss on the outside for camouflage in a protected location in a shrub, bush or tree. She lines the nest with soft plant fibers, animal hair and feather down, and strengthens the structure with spider webbing and other sticky material, giving it an elastic quality to allow it to stretch to double its size as the chicks grow and need more room. The nest is typically found on a low, thin horizontal branch. The Rainbow Starfrontlets primarily feed on nectar taken from a variety of brightly colored, scented small flowers of trees, herbs, shrubs and epiphytes. They favor flowers with the highest sugar content (often red-colored and tubular-shaped) and seek out, and aggressively protect, those areas containing flowers with high energy nectar.They use their long, extendible, straw-like tongues to retrieve the nectar while hovering with their tails cocked upward as they are licking at the nectar up to 13 times per second. Sometimes they may be seen hanging on the flower while feeding. Their calls are described as a thin "rip" and a high, wiry, squealing chatter that rises and falls in pitch.